Step 1: create a domain. Step 2: create a subnet. 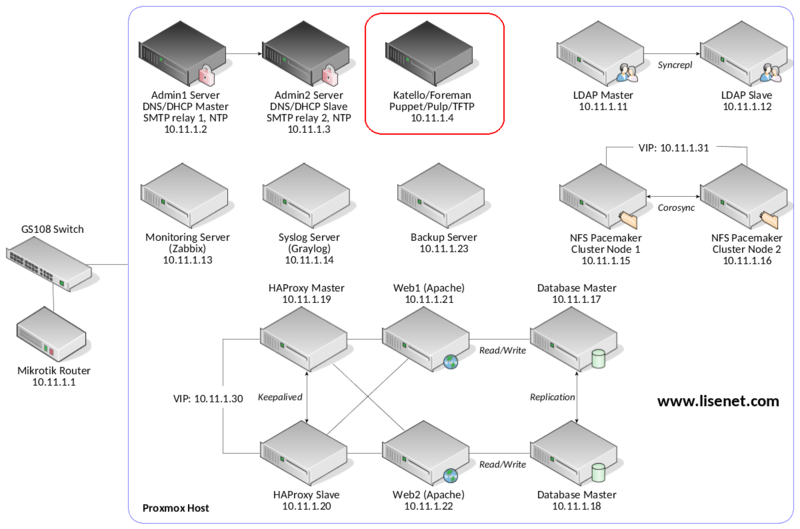 Step 3: set up FTP installation media for provisioning. Step 4: create a hardened partition table for provisioning. Step 5: create an operating system. 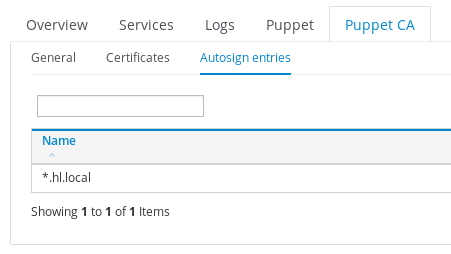 Step 6: provisioning templates and Puppet 4. Step 7: create a host group. Step 8: create a new host. Step 9: create KVM guests on Proxmox. Step 10: PXE boot the VMs. Step 11: autosign Puppet signing requests. Step 13: backup Proxmox guests. Chances are the domain name has already beet set up if you provided it during the Katello installation. # hammer domain create --name "hl.local"
If you get an error saying that the “Name has already been taken”, it is likely due to the Katello server not being assigned to the organisation. If that is the case, then after assigning the Katello server to the organisation you will be able to see the domain name. In order to create a subnet we need to know our TFTP ID. TFTP ID is actually our proxy ID. We’ll install and configure vsftpd to provide CentOS installation media via FTP. Note that FTP volume /var/ftp/pub/ should have at least 6GB of free disk space. If you don’t have a CentOS 7 DVD, you can download it from the Internet. Make sure it’s a full DVD and not a minimal one. As we can see above, the default one for Red Hat is called “Kickstart default”. We are going to create a hardened partition table so that we have control over partitions and mountpoint that get created. Create a file hardened_ptable.txt with the content below. Note that there is no space between < and %#. part /boot --fstype="xfs" --ondisk=sda --size=1024 --label=boot --fsoptions="rw,nodev,noexec,nosuid"
logvol /home    --fstype="xfs"  --size=512  --vgname=vg_os --name=lv_home --fsoptions="rw,nodev,nosuid"
logvol /tmp     --fstype="xfs"  --size=1024 --vgname=vg_os --name=lv_tmp  --fsoptions="rw,nodev,noexec,nosuid"
logvol /var     --fstype="xfs"  --size=6144 --vgname=vg_os --name=lv_var  --fsoptions="rw,nosuid"
logvol /var/log --fstype="xfs"  --size=512  --vgname=vg_os --name=lv_log  --fsoptions="rw,nodev,noexec,nosuid"
logvol swap     --fstype="swap" --size=2048 --vgname=vg_os --name=lv_swap --fsoptions="swap"
This step isn’t required in our particular case because the Katello server is deployed on CentOS 7, and the operating system for that has already been created. Since our homelab is CentOS 7 only, there is no need to create a new OS. Note references to the FTP installation media and the hardened partition table. Katello Kickstart Default – Kickstart template for CentOS, RHEL and other Red Hat-compatible operating systems. Katello Kickstart Default Finish – image-based provisioning. subscription_manager_registration – Snippet for registering a host for content. To customise any of the above templates, we can clone them and add our changes. I ended up cloning some of the templates (see below), editing them manually to match my needs, and creating the new ones. When we provision a new CentOS 7 server, it gets the subscription-manager package installed from the “os” repository, and then the system registers against Katello. This allows us to use products and repositories, and manage packages that are available to the server via a lifecycle environment. subscription-manager register --org="<%= @host.rhsm_organization_label %>" --name="<%= @host.name %>" --activationkey="<%= @host.params['kt_activation_keys'] %>"
echo "Removing public CentOS repositories"
A host group is in some ways similar to an inherited node declaration, in that it is a high level grouping of classes that can be named and treated as a unit. This is then treated as a template and is selectable during the creation of a new host and ensures that the host is configured in one of your pre-defined states. In addition to defining which Puppet classes get included when building this host type we are also able to assign variables and provisioning information to a host group to further refine the behavior of the Puppet runtime. We’ll use the homelab environment when creating a host group. We’ll also need to create a Puppet folder structure when configuring Puppet modules, but this will be covered in the next article. Create a new host group for CentOS 7. We want to create hosts for all our homelab servers. If we loop the details above through the following command, we’ll end up with all the servers that we need. The VM ID is used by Proxmox only and isn’t required by Katello. Before we can PXE boot the VMs, we first need to create them. Again, if we take into account the VM details that we’ve listed above and loop them through following qm command, we’ll end up with all the servers that we need. One thing that’s worth mentioning, when you create a new VM for PXE boot, make sure that it has at least 1536MB of RAM, as otherwise it may fail to provision successfuly. The amount of RAM can be reduced after a VM is configured. Also note the disk size that we use, it’s set to 32GB to match the hardened partition table template. Start the VMs, watch them PXE boot and get provisioned by Katello. As mentioned earlier, the amount of RAM can be changed after a VM gets provisioned. I was unable to find a way for Hammer CLI to sign the certificates remotely, and there doesn’t seem to be a method to create autosign entries using the CLI either. The proxy normally auto-determines the location of the autosign file by knowing the version of Puppet that’s loaded – the path in the log is a Puppet 3.x location, while our file is at the Puppet 4.x location. Since we are on Puppet 4.x, the real question is why the proxy is wrong? We store resulting files to /mnt/backup/, and also send an email to the root user upon completion. If all went well, then at this point we should have all of the homelab VMs created and running. We’ll start looking into Puppet modules, and how we can use them to configure various homelab services automatically. Hi, in the file hardened_ptable.txt a space has sneaked into the code between <and%. Kickstart will fail. Thanks Daniel. I fixed that now. WordPress isn’t great when it comes to formatting. Thanks. I said that before, WordPress isn’t great when it comes to formatting. Small error in the table below step8, the ipaddr and macaddr labels are switched around. Thanks very much, I’ve fixed that.